Blurb: THE KING IS DEAD, LONG LIVE THE KING . 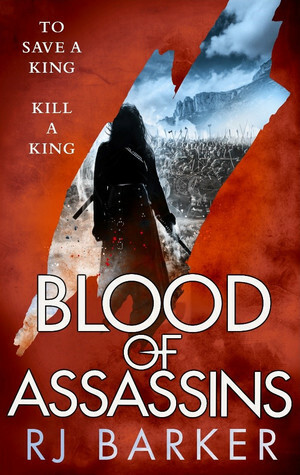 . .
You know, I kept reading reviews over Blood of Assassins and how it was better than the first book in so many ways (some arguing in every way). And you know what? Don’t get me wrong: the first book, Age of Assassins, was absolutely stellar. It has such a unique voice with so much intrigue and worldbuilding, that it became hard to do anything but not just enjoy the hell out of it. I expected much of the same with the sequel and yet I found every element that I enjoyed about the first book was not only present, but also heightened. We had a nice range of characters present in the first book and new ones to add to the mix. I hadn’t expected five years to pass between the events of book one and two, but obviously that is a significant amount of time. As such, you’d expect these characters to grow and change. And boy howdy, did they. Girton in particular, our protagonist, experienced a whirlwind of development from the first book to the second, but not only that, we got to see his character continue to shift and grow and evolve within the narrative itself. While I spent the first half the book wanting to scream at him, “Seriously, what are you doing?“, the second half of the book, I could feel nothing but pride over the choices he made and the growth he experienced. This type of development doesn’t usually feel so potent (or maybe that’s just me), but here, it felt like the center of the book and I was totally okay with that. The writing itself, as always, was completely lovely. I found myself getting lost pages upon pages at a time and it was so easy to slip back into this world and completely block out all of my surroundings. The second half of the book, I started reading during my dinner break, only to sneak in more during the last hour of my work shift and then I stayed up another hour after my bedtime to finish it as soon as I got home. Terrified by what’s going to have in King of Assassins, based on that epilogue (and that teaser chapter!? *dies*)? But positively stoked, as well. If you haven’t read Barker, I recommend you check him out, if for nothing else aside from the beautiful writing, unique POV and killer (literally) plot. But once you read this trilogy, you’ll also discover fantastic, real characters with depth and evolution, a premise that you will leave guessing and surprise you just when you thought you’d figured it out, a world that is as dark as it is intricate and yawning more than you usually do, because, you know, who needs sleep when you have another chapter left to read? Next postHuh, Would You Look At That?